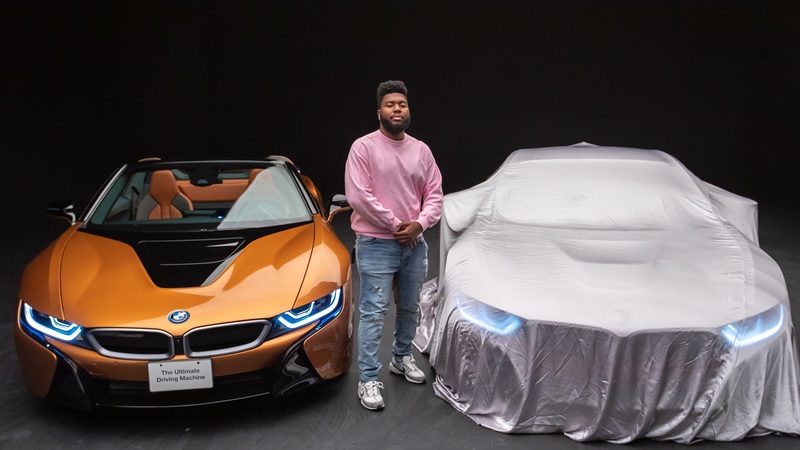 Earlier this week, a new collaboration was announced between BMW and pop star Khalid. The two joined forces for this year’s Coachella under the #roadtocoachella experience. Part of this venture is a brand new BMW i8 Roadster that was “designed” by Khalid himself and will be driven to the location in California as part of a road trip to the famed music festival. As promised in the initial announcement, the design includes similar patterns to the album cover of Khalid’s latest creation: “Free Spirit.” The i8 Roadster is said to get a similarly wrapped BMW i3 later on, the two forming a formidable pair. As for how Khalid felt while doing this collaboration with BMW, you’ll find out in the video below. Needless to say that he shows gratitude and declares himself a fan since his childhood. The Road to Coachella will kick off tomorrow right after Khalid’s new album is launched. A fleet of cars will be setting off towards Coachella featuring a group of influencers and VIPs who will experience the fleet on the #RoadToCoachella drive, and attend the festival, documenting their journey in real-time with the campaign hashtag. Between April 11 and April 15 the group will stop in Palm Springs for a pit stop. This is where fans will get a chance to attend a meet & greet event with the top billing performer, enjoy a variety of food trucks and browse the Free Spirit shop. iHeart Radio will hold a sweepstakes where one lucky fan will win a Coachella weekend including: use of a custom wrapped i8, roundtrip airfare, hotel accommodations, festival VIP tickets and parking pass.